« the story behind the photograph. What are we going to do with all these people? 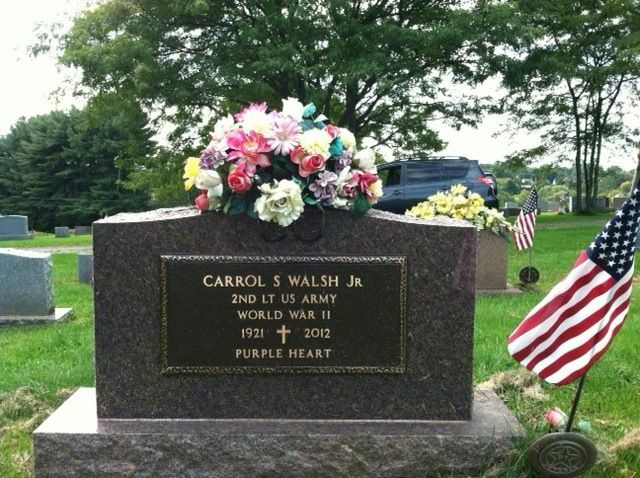 Carrol S Walsh Jr. At rest in Johnstown, NY. Photo by Elizabeth Connolly. Thirteen summers ago, I sat down for an interview with an amazing man. What he would relate to me, and what I would do with it, would go on to change both of our lives. A seemingly small incident would be recalled almost as an aside in the wider context of World War II, but then would go on to reverberate through time, and space, creating ripples in the cosmos that grew into waves. Big waves that would carry me, and many others, to places we had never thought possible. You see, on Friday, April 13th, 1945, twenty-five hundred lives were saved as advance elements of the U.S. Army 743rd Tank Battalion, 823rd Tank Destroyer Battalion, and 30th Infantry Division stumbled across the crime of the century, perhaps of all time. A train transport stopped at a railroad siding. Open boxcars, sealed boxcars, shabby passenger cars, engine. Some people wandering about, others too ill to move. Sick and emaciated human beings. Women. Men. Children. SS bands roaming the countryside. Orders to execute. A bridge over the River Elbe ahead to be blown to smithereens. With the transport, and the people on it. The soldiers told me their stories. In the course of collecting their narratives, we found others who played their parts and rescued those people. I listened. We wrote. We recorded, and I posted. Then, the wires began tripping. Seven Septembers ago, we put together the first of many reunions between these soldiers and the child survivors of the Holocaust they rescued. “Joyful” does not do it justice. What do you say to the men who saved you and your family when you were a child? Carrol smiles, grips their arms in greeting, and laughs, “Long time, no see!” Sixty-two years, that’s all. On April 13th, 1945, the war weary, “seen-it-all” twenty-four year old second lieutenant is in for the shock of his life. Five years ago this week, we put on quite a show at our high school. High school kids listening to, meeting, sharing, laughing, crying, even dancing with octogenarian U.S. soldiers and Holocaust survivors. ABC World News called my classroom and told me they were on their way up from NYC headquarters to film us. You can see Carrol, and listen to fellow tank commander George Gross’ narrative from our interviews, and hear fellow soldier Frank Towers describe his role in the liberation. The last evening together, soldiers and survivors from all over the world watched the broadcast together, and we said our prayer of thanksgiving. Hundreds of students became the witnesses for the generations to come. And so it comes full circle. Nearly ten percent of the passenger list has been found, over 60 years later. Profound things keep happening. We lost Carrol less than two years ago, George earlier. So I write this week to remember, and remind myself of what a legacy, and gift, they left us. While it may have been a tiny part of very productive lives (a New York State Supreme Court justice, and English literature professor, respectively), for the rest of my days I will think of the times I got to talk to them, and smile. Indeed. Just look at the generations that sprang forth, because of what our soldiers stopped to do, in a shooting war. In complex, fluid situations, there are no easy answers, but don’t you think that there is a very important lesson here? It was not part of the mission. But maybe as a society we should break down and examine the values that made the mission change, if even as a “sideline”. Sometimes it just feels good to feel proud. They don’t owe us anything. Not a thing. Being one of those liberated survivors, along with my mother, I am endlessly grateful to Carrol Walsh and George Gross whom I had the great privilege of meeting, thanking and hugging in person. And then there’s the unstoppable Frank Towers and the other men from the 30th Infantry Division who did so much for us. Thank your forever. And Matt, thanks to you for bringing us all together – what a great service you have done for all of us survivors and liberators! What can I say but how proud I am of my fellow classmate, Matt Rozell, Person of the Week, Teacher of the Year, Man of our Time! Great job Rozie! !